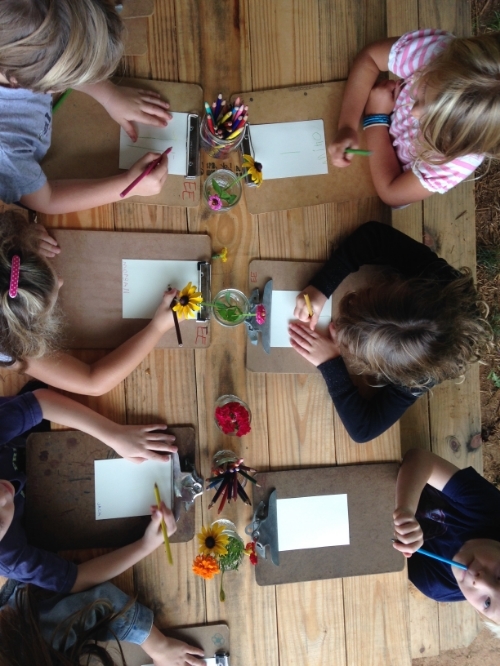 Kindergartners practice using their sense of sight to explore nature with "super power eyes". Hand lenses are a tool of science that can be used by anyone, big or small, to notice and explore things they might not otherwise be able to with just their naked eye. Something else that happens when you put a hand lens in the hands of a kindergartner is that they SLOW down. It was amazing to watch them go into the woods and explore, to see where they went, where they stayed, and what they found. Ant hills became complex cities to study and ordinary branches turned into a wonder of color, texture and form. "Ms. Marin, look at all of the colors on this leaf!" "Ms. Marin, look, you can see the holes where this plant is breathing!" "Ms. Marin, see how this leaf is starting to turn to soil! I can see where parts of it have already fallen away!" And, my favorite question, "Ms. Marin, what is this???" This activity was a wonderful reminder that just a simple shift in perspective can help us see the world in a whole new light. I've got lots of hand lenses down her in the science lab- come give it a try! 6th graders are learning the language of flowers this week. Students are learning about careful dissection and using the tools of science to explore the basic structures of a flower and their associated functions. As a part of this year's 5th grade Food and Farmer expedition, Environmental Education and Technology teachers are collaborating to support the classroom learning in meaningful ways. In class, students are exploring sustainability in relationship to food and agriculture. This is a big topic that can be explored through both environmental and social lenses. The classes visit farms in our community, talk to the farmers and learn about the different ways food is grown, who grows it and where the food goes after it is harvested. In their Environmental Education enrichment class, students are assimilating what they learn in the field and are applying it here on campus. Specifically their awareness about and reasons for sustainable agriculture. We are working together to better understand the WHY and HOW of various sustainable agriculture techniques and then implementing some of them in our Peace Garden. In technology with Mr. Kevin, students are using this project to practice their newly acquired technology skills, such as how to manage their personal account, save files, upload images, etc. They are learning about photo documentation- how to capture images that are useful, emotional and interesting- by using the ipads to capture images of themselves implementing the sustainable practices they are learning about. The final product of the 5th grade Food & Farmer EE and Technology collaboration will be a series of educational "Information Artwork" posters that both show and tell about the work they completed in the garden. The amazing farmers we collaborate with, our growing Earth Garden and these posters from Lexicon of Sustainability are the inspiration for this project. Stay tuned for more images, stories and final products from this group of amazing young farmers! Sustainable and Organic- Is one always the other? "Ms. Marin, how come we call cucumbers vegetables but they are really fruits?" This question, and many more like it, emerged when we integrated a strong science component into Kindergarten's "Our Bodies, Our Selves" curriculum this fall. While students explored how to make healthy food choices for their body using the state's required "Healthy Plate" curriculum in class, they learned about the main six plant parts and why they are important to both plants and people with Ms. Marin in their Environmental Education enrichment. Kindergartners caught on quickly- to the names and function of the different plant parts, but also to the incongruities between the language we use for plants when we are using our "science smarts" and when we are using our "healthy plate smarts". It's true, many of the foods we casually call vegetables are actually fruits, scientifically speaking. And, seeds are called grains or proteins, depending on what kind of seed it is. Together, we figured this out and then made a book about it to teach others. Check out these digital books our Kindergarten classes created about the science of healthy food choices. You might learn a thing or two!